By Bonnie Leonard Ed D.
Stillwater River Publications, 9781946300492, 150pp. The essential first step for any midlife woman ready to reinvent her life. If you're stuck at the midlife crossroads, wondering "what's next", Midlife Magic provides a powerful first step for your midlife renewal adventure. 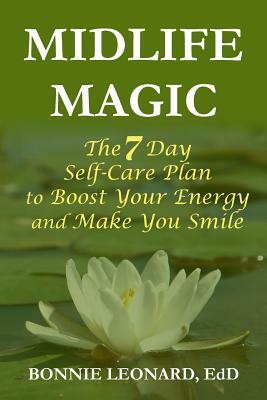 To begin your journey, the author guides you through an easy-to-follow, self-care program in seven days. - On each day, you join the author in a different locale as she travels the world on her own midlife voyage and discovers a self-care skill she desperately needs. -Then you learn to develop this skill yourself with specific instructions and real-life examples from other midlife women the author has advised and coached. -Finally, you select one action step (from a list of many) to put into practice that very day. By the end of the week with your personal self-care plan in place, you will be a stronger and more resilient midlife traveler-ready to embark on your adventure with a smile on your face. This book was prompted by Bonnie Leonard's own midlife sabbatical travels when her younger son headed off to college and she faced an empty nest. After a series of misadventures and encounters, she began to understand how little she attended to her own needs. Like many women, she devoted years to raising her children in addition to her work, which involved caring for the graduate students she taught at Lesley University. Later when the author became the Dean of Continuing Education for return-to-college women at Wellesley College and then a Midlife Coach for Women, she came to understand the critical role self care plays for any woman navigating the midlife passage. This insight from her professional and personal experiences motivated her to write Midlife Magic: The 7 Day Self-Care Plan to Boost Your Energy and Make You Smile. In this book, Leonard offers women a practical and user-friendly way to become a hearty and happy midlife traveler.